When Richard Papen leaves his depressing home town in California for small, exclusive Hampden College in New England, he has no idea the lifelong impact his time there will have on him. A former pre-med student turned English major, Richard tries to make his way at his new school, and sets his sights on a class on the Classics, following his love of the Greek language. Much to his confusion, he is turned away by the professor, who explains that he only accepts five students at a time. Richard becomes fascinated with these five unique students: Edmund (Bunny), Henry, Camilla, Charles, and Francis. They associate almost exclusively with each other, and seem to exude money and confidence. By chance, Richard does find his way into their inner circle, becoming one with the group…or so he thinks. It is not long before he realizes that there are things his new friends aren’t telling him, hostilities that run deep among them, and evil lurking just beneath their surfaces. What can I say, I’ve been into books about friendships taking a turn for the dark lately. I’ve been looking forward to reading this since pretty much the minute I finished The Goldfinch, and I knew Donna Tartt wouldn’t let me down. Again focusing on a troubled young man, The Secret History focuses on literature and it’s impact on human thought, where The Goldfinch put that focus on works of art. In both instances, that influence is not always a positive one, as Richard begins to see in his new group of friends. The Secret History is a relatively dense book, but a very readable one. I read it on vacation, and was able to read for hours uninterrupted, but when I wasn’t I often found my mind wandering back to Richard and Henry and their friends, wondering what would happen next. An interesting thing to note is that it reads like a mystery, but the answer is given to us from the first page: Bunny is dead. Donna Tartt then spends the rest of the novel delving into how it came to that desperate end. How a friendship turned inescapably toxic. She forces the reader to examine their own morals as they go along with Richard and Henry and the rest for the long ride that is their Secret History. Much like We Were Liars, The Secret History is about a fascinating but questionable group of friends, and the dark turn that friendship can sometimes take. Also like We Were Liars, I don’t want to say too much and give away the details. While I sped through this book, it was much less “action packed” than The Goldfinch, and was much more cerebral. The characters were just as flawed, but lived more inside their heads than outspoken Boris and Xandra in The Goldfinch. I know I should stop comparing, but it’s so difficult not to! I just love Donna Tartt, what can I say. I don’t know what I’ll do once I read The Little Friend and have to wait ten years for another one! So yes, take my word for it: read The Secret History! And The Goldfinch. But I’m off track again. 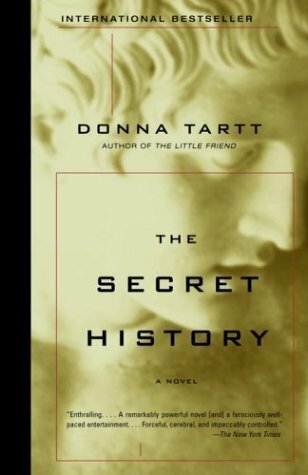 Have you read The Secret History or any of Donna Tartt’s novels? Which is your favorite? I’ve read the Goldfinch, but this one is still on my TBR list. It sounds really interesting though! I like the fact that it focuses on literature, because I am more interested in literature than in art. About half way through The Goldfinch, and as an art history student I’m loving it! Have heard excellent things about The Secret History, it’s on the TBR list. They’re both so amazing, but The Goldfinch definitely is number one in my book! I read The Goldfinch for the Baileys short list and immediately had to start The Secret History, like you. I am halfway through and I absolutely love it. I also find myself thinking about the characters in the book when I’m not reading it. They seem so vivid and alive. Donna Tartt is fast becoming one of my favourite authors! Great review!